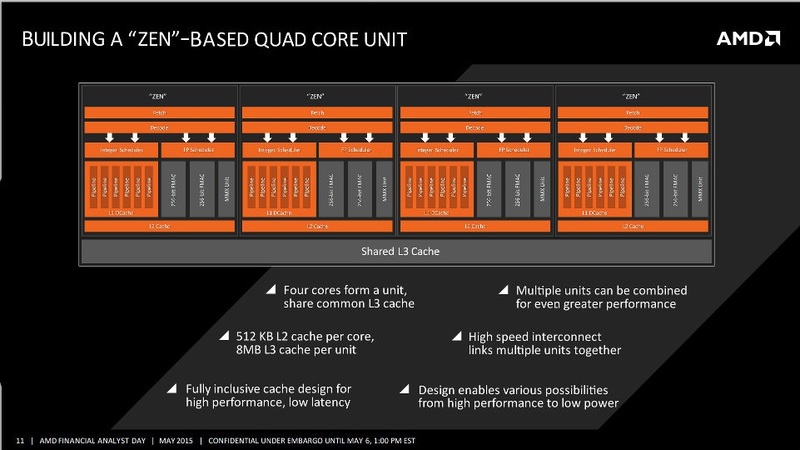 Few could argue AMD’s Financial Analyst Day conference wasn’t very interesting; we have learned that not is the company planning to release the R9 390X with the rumored HBM (High Bandwidth Memory), but that Zen will be a vast improvement over Bulldozer. In fact, at roughly 40 percent improvement IPC, it’s probably one of the biggest performance gains a CPU architecture has seen – and certainly the biggest from either AMD or Intel in a number of years. 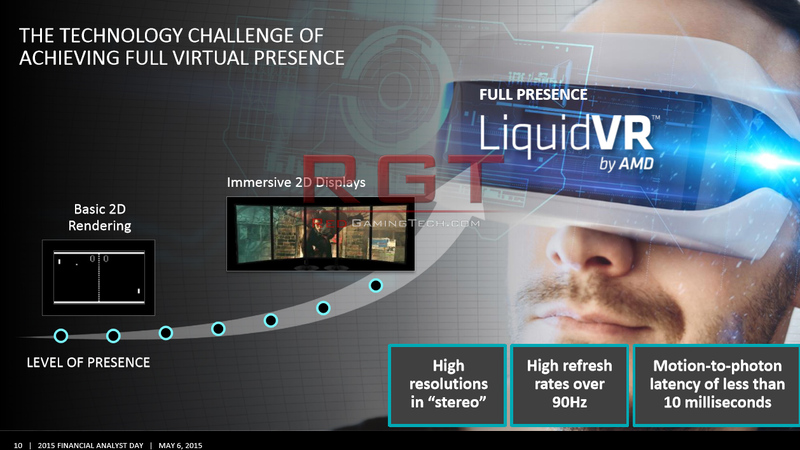 But there’s more than just that – AMD’s strategies also revolve around server technologies, Virtual Reality (including Liquid VR) and support of low level technologies. 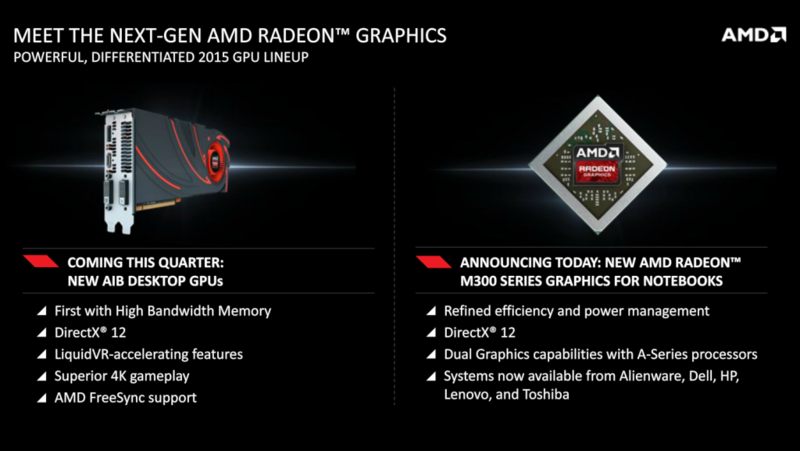 Starting things out with the graphics, AMD’s R9 and R7 300 series will see a release over the coming months, directly replacing the 200 series GPU’s. AMD have just started to release the low to min-range 300 series to OEM’s, with the R9 380 (Tonga Pro), R9 370 (Curacao) and the R9 360 (Bonaire Pro) officially seeing a release. The R9 380 OEM is a slightly beefed up version of the R9 285 Tonga, containing the same number of shaders (1792), but a more generous amount of RAM (4GB), but equal amounts of memory bandwidth (176GB/s). It remains to be seen if retail models are clocked a little higher. In the above table comparison, it’s easy to see that the Tonga Pro is easily the fastest of the currently available OEM GPU’s available from AMD. 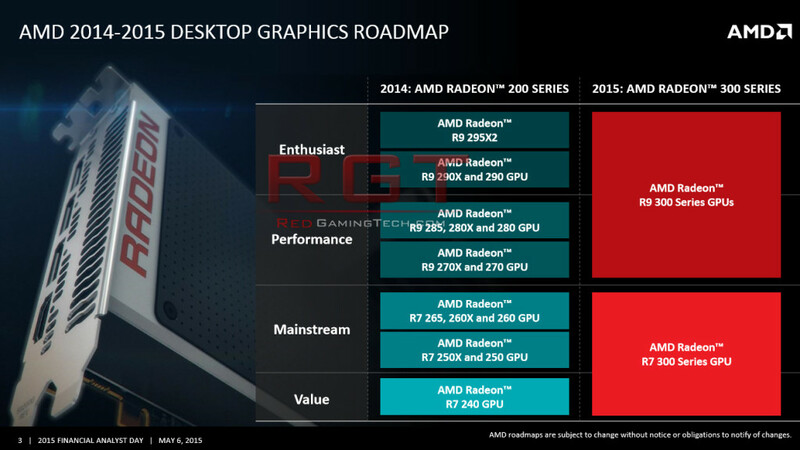 Effectively, they are just rebranded versions of their R9 200 series GPU’s (which had been rumored for sometime); this isn’t a bad thing – providing AMD price these SKUs aggressively enough. Moving away from rebrands, what about the newer cards? AMD have already announced their plans to be first on the market with the High Bandwidth Memory (which they’d help pioneer, but in an effort to make it cheaper have decided to make it an open standard). The R9 390X (Fiji) will be aimed at high end gamer’s, primarily at 4K displays and Virtual Reality. We don’t have all the specs at the moment (unfortunately) but there have been a myriad of leaks concerning it. 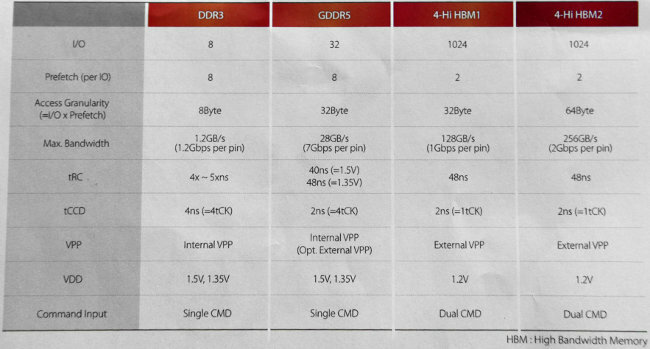 What we do know is the R9 390X will use HBM, and this will set right alongside the GPU on a 2.5D die and then connected to the GPU via means of an interposer (think a bunch of wires). With each chip being 1024 bit, we should see a 4096 bit interface, and depending on the clocks hit around 640GB/s bandwidth. Supposedly there will be both a 4GB and an 8GB model available. In terms of shaders, ACE’s, ROPS, TMU’s and so on, things are less certain; a commonly touted number is 4096 shaders running at around the 1GHZ mark, this is because an AMD GPU on the SiSoft Database. They have delve into virtual reality, including by use of LiquidVR, which is an SDK middlewear designed to reduce latency and improve motion tracking. High frame rates are extremely important to gaming, and a refresh rate of 90Hz or desirable to help reduce eye stain and improve user experience. Personally, I’ve used the Oculus Rift DK2 a few times, and a common complaint is motion sickness, and part of this is said to be caused by latency and inconsistent frame rates. 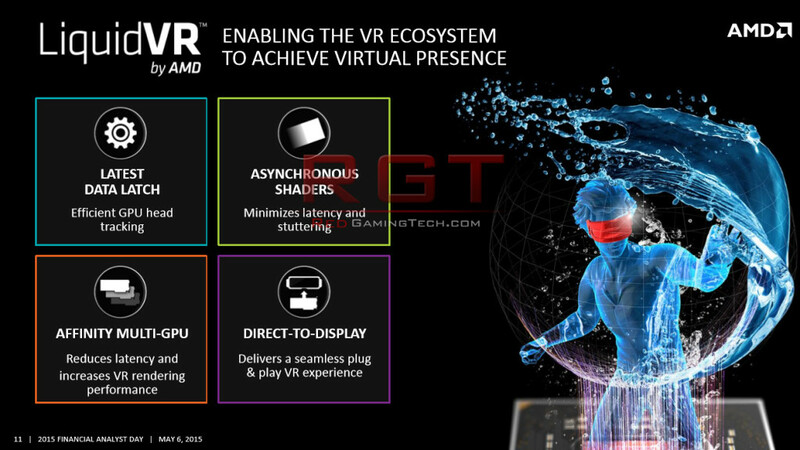 AMD are marketing LiquidVR to help with this, and will work by having the ACE’s (Asynchronous Compute Engines) farm off work to the GPU’s ALU’s during bubbles in the rendering pipeline. This should allow reduced latency and stuttering and also allow for better head tracking (by using compute to handle it) along with other tasks. How well any of this works in reality no one outside of AMD knows – and from my understand with a conversation with them, will require a little coding from developers – but should work across a myriad of API’s. Effectively, I was told that basic implementation is fairly easy, but tweaking the code (particularly in the first case of using it) might take a less experienced developer a little time. Next year, we should also see the successor to the 300 series, known as the Arctic Islands. Naturally details are a little thin on the ground, but it’s confirmed that it will enjoy a new Fin-Fet process which will allow the new series of GPU’s to be considerably less power hungry – while offering better performance (a figure of about 2x is being promised). After the noise and heat of the R9 290X, it will be a welcome change for gamer’s. 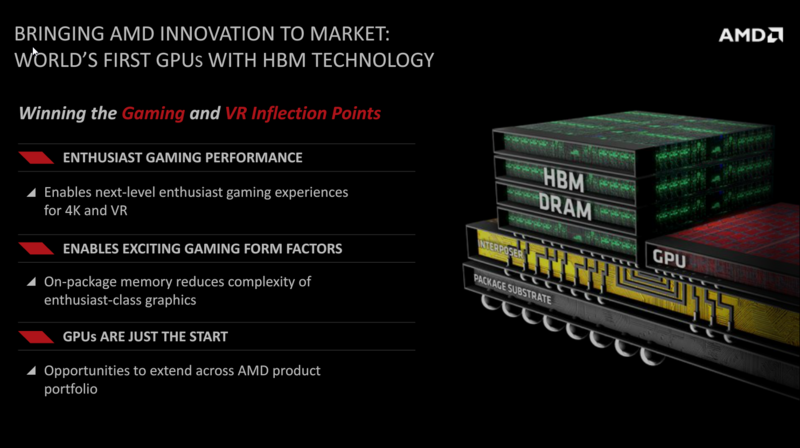 The only other detail we can say for certain is that the 400 series will continue using HBM2, while their 300 series will use HBM1. This switch will make 8GB cards cheaper and easier to produce and also considerably greater memory bandwidth. While the IO remains at 1024, and latency and even power requirements stay about the same, the raw max bandwidth skyrockets, doubling the per pin from 1Gbps to 2Gbps. Moving to the CPU side of things – we’ll have to wait until ‘some point’ in 2016 for Zen to emerge; despite being in development for some time (reports indicate that progress was decent on the project even back in 2013). Zen will be a radical departure from Bulldozer (Vishera) and support a plethora of new technologies and also mark the shift to AMD’s newest socket, AM4. AM4 has been shown to be the socket of choice for both APU platforms and also the new line of FX processors, allowing customer’s to easily transition between upgrade paths or re-purpose old hardware. While it’s a plus, it’s not really super important for the average PC gamer – but then again, things may be very different with how DX12 handles multiple GPU’s such as pairing a discrete GPU with an integrated. From what we do know, it will be a completely radical new design (we’ll get into specifics in a moment, as much of the info comes from rumors) that will support Simultaneous MultiThreading (SMT) – this allows AMD’s CPU’s to behave more closely like their Intel counterparts. In theory, this will provide higher throughput and better performance – both single and multithreaded. 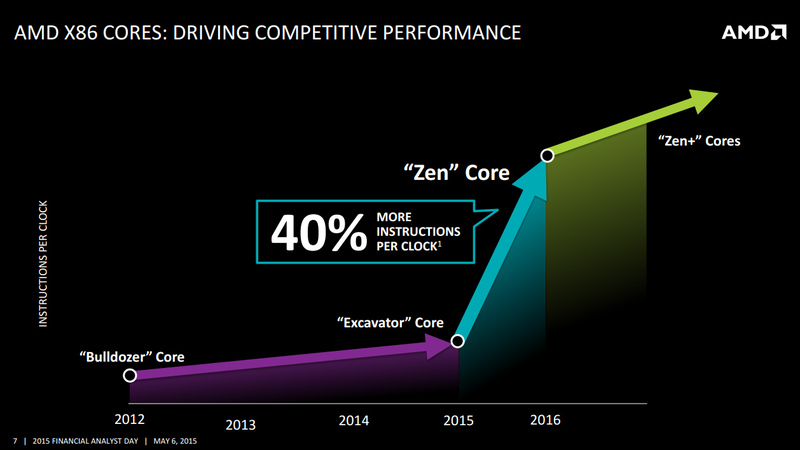 All of this will mean that Zen will be provide 40% more instructions per clock – which is pretty damn impressive; if it’s accurate it’ll be one of the biggest leaps in performance from a processor company in… well, a long time. Though Zen+ will take on what Zen builds and improve on it – but we’ve so few details about Zen+ we can only take AMD’s word on it. Cache was a bit of a weakness of Bulldozer, and it’s undergoing a radical new redesign for Zen. That’s unfortunately all the official info we have, but getting into some speculation (with supposed leaks) we’ve a lot more we can talk about. A Zen module is comprised of four CPU cores, each core complete with its own 512KB of dedicated cache, but is also allowed to share a larger pool of Level 3 cache. 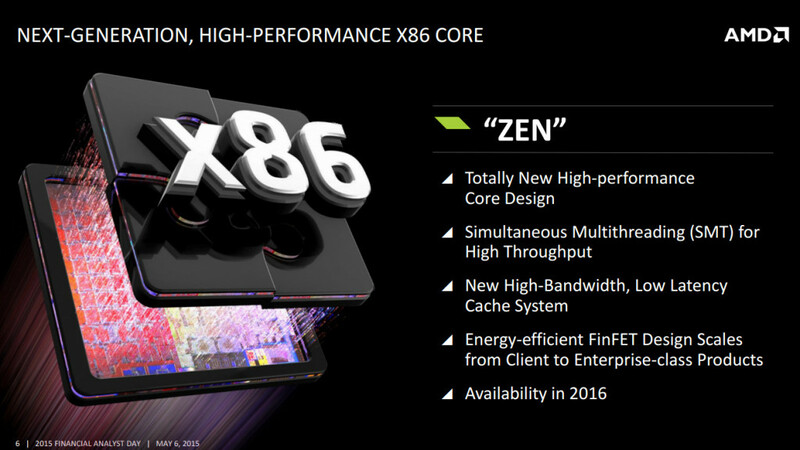 Naturally Zen ‘blocks’ will all be interconnected together, with desktop variants supposedly having eight cores (thus, containing two Zen units). On a smaller scale, looking at each CPU core, there’s significant differences between the processors front ends; the twin Integer units are gone, replaced by a larger single unit. The Floating Point Unit also looks like it’s been working out at the gym too. Switching to the floating point units, and one will notice that it’s twice as wide as AMD’s previous generation. There are two FMAC 256-bit units, and smart money is on them being able to work together to process 512-bit AVX floating point instructions. This assumption is based on the Excavator processor legacy, where it’s two 128-bit FMAC’s could process either a 128-bit SIMD instruction for each clock cycle, or work together and process a 256-bit AVX instruction. See more on the core leak here. Of course, roadmaps and slides are one thing – but actually testing the product and seeing if it lives up to expectations are another. If AMD can indeed live up to the promises made, it will ignite some real competition in the PC market space, and perhaps even a little innovation. For PC gamer’s, it’s all good news – whether AMD, Intel, Nvidia or Bob’s Processors (the last one might not be real) produce the best hardware, the additional competition just helps us all get better products at a cheaper price. Intel’s Skylake is out this year, but whether AMD’s Zen will up be up against Skylake, or Cannonlake (which is out next year) isn’t known considering we don’t have the release dates to compare. In the next part of the analysis we’ll be taking a look at AMD’s APU’s and their server / professional level products. This article was filed under Articles, Features, Gaming News, Hardware, PC Gaming News, Tech News. 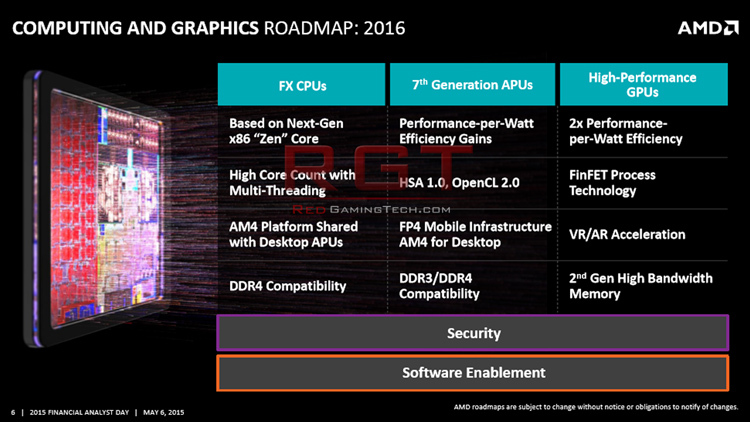 Tagged with AMD, amd roadmap, gpu, graphics, processor, roadmap, zen.